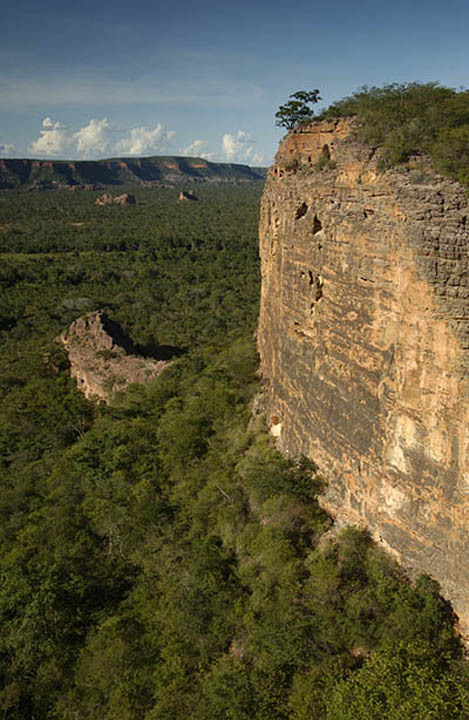 Wolf Cliffs and Valley, Parnaíba Headwaters National Park, Brazil. Photography: Pete Oxford. Maned Wolf & Hyacinth Macaw Photo Tour. Wolf Camps has no malaria anywhere nearby, it has virtually no mosquitoes, and in April through October it has almost no rain (and in May through September, you have about a 97% chance or 99% of having no rain during any given 3 or 4 night stay. Also, the wildlife is low, at ground level, making it easy to photograph. The Maned Wolves seem to encounter so much wild fruit and mice in November or December through, perhaps, February or March that they may become unreliable at that time, but whenever I have gone to the site in April through October, I have seen the Wolves on the first night and every night. Also, the Hyacinths really are seen in large numbers on the ground and in low trees at close range from April through August, but from September through the end of March, they may or may not be on the ground at feeding spots, but are more reliably at their nest sites, which means pair by pair in individual nest holes. We believe that it might be possible to have a small number (8 to 16) on the ground at 10 to 15 yards or meters even through the nesting months, but that is a hypothesis that we have only partially tested. These 12-pound monkeys use a number of tools in unique ways not seen in any other monkey species in the world, thus making them demonstrably the most intelligent monkey species on the planet. They use specially-chosen hammer rocks of harder material than the normal rocks around and use them to crack hard palm nuts on special, softer anvil rocks. They also use digging tools to get buried food items. The remarkable tool use of these monkeys was first revealed to the world in 2001 in National Geographic in a note from Charles Munn and Pete Oxford. Munn then enticed world-famous psychologist/primatologist Professor Dorothy Fragaszy into starting what has since become a permanent, multi-national research effort on these monkeys. We like to call them "the Einstein Monkeys". These monkeys have appeared over and over again in BBC and National Geographic TV documentaries, and now, thanks to ongoing protection by the managers of Wolf Camp (all of whom are former animal trappers), it is now possible to watch their fascinating tool use from only 10–20 feet away. You are so close to the action now that safety glasses are recommended to avoid shards of nut shells hitting you in the eye! The red macaws – which means the Green-winged Macaw or Red-and-Green Macaw (two names for the only red macaw found in that part of South America) – can be guaranteed year round at our feeding spot at Capuchin Valley. But it will be ongoing work for us to make sure we have enough of their favorite nuts (which we have to buy and store and stockpile and dole out bit by bit the rest of the year) to be able to ensure that these macaws will always be available. Wolf Camps is the only entity of any kind that is patrolling the new park. We are in touch with the Brazilian National Park Service about their putting in rangers, but 32 months after the creation of this park on paper in Brasilia, there still is not a single warden or guard station! So we are it, for the time being. I hope this changes, but as we are in the best location in the park, or one of the best locations from a handful of best locations, we are in a good location to protect the best stuff in our part of the park, which is one third the size of New Jersey! And we are in the only part of the park that both is great for wildlife and is reachable in less than 6 hours from any jetport.